Smart and Easier setup of Appointment Theme slider. We have used the bootstrap slider in Appointment Theme. It will work for all devices like tablet, desktop, and laptop. There are two effects in this slider (slide and fade). When you will use Appointment Theme you can check both effects. In this theme, you can put your own text like slider name and description. You can also add video on the slider. Now, I am telling you. How we can manage slider settings. 1. How to add Post Category? Here you can create a category with your named then click on Add New Category button. 2. How to add Slides? Here you can add slides using post format. 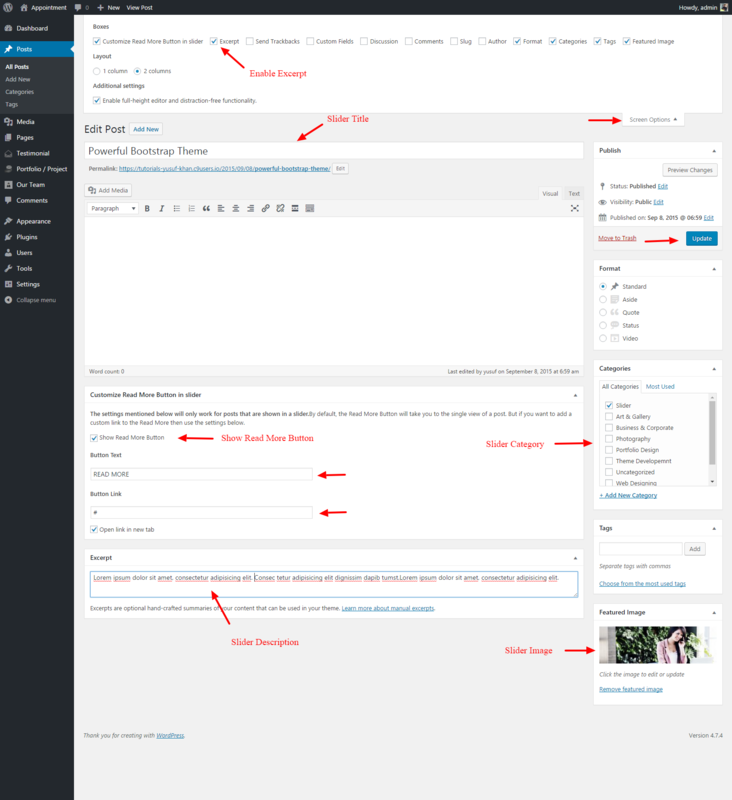 You can display in all available post format in your sliders like that standard, video, aside, quote and status. Do following below steps. Here you can enter post title, description, select Aside Format, select your category and upload image using Featured Image option then Publish your post. Refer the screenshot. Here you can enter post title, description, select Quote Format, select your category and upload image using Featured Image option then Publish your post. Refer the screenshot. Here you can enter post title, description, select Status Format, select your category and upload image using Featured Image option then Publish your post. Refer the screenshot. Here you can enter post title, description, select Video Format, select your category and video. 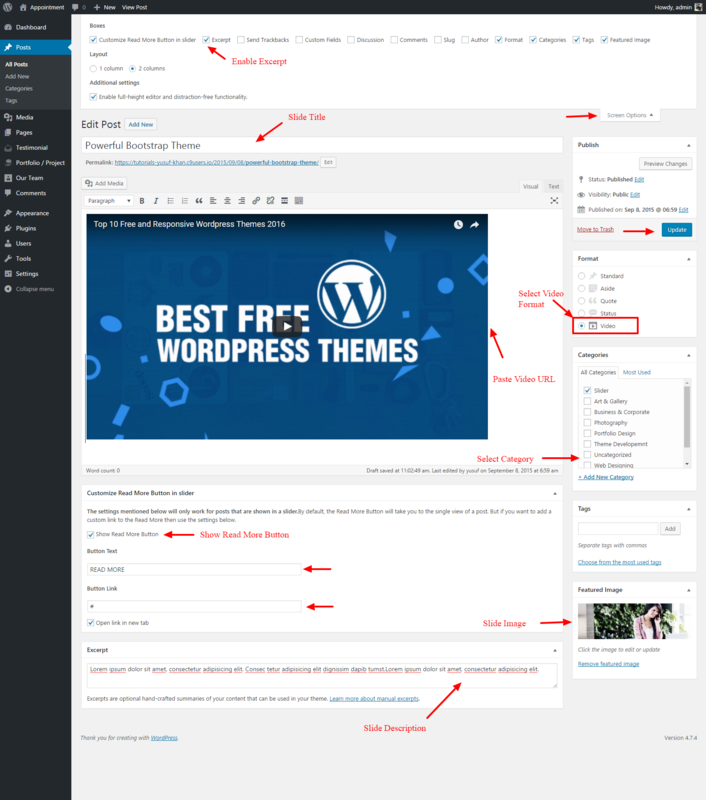 You can add video youtube, Vimeo and wordpress.tv simply paste your video link in the text editor then Publish your post. Refer the screenshot. 3. How to display slides? Here you can see Featured Slider Settings click on this tabs. After click it will show slider settings like that below. Select your category and click on Saved button displaying on top right. Now check your homepage slider work will perfectly. Hide Slider from Homepage – Hide you slider section on your homepage. Select Slider Type – Select demo or Your own slider images. 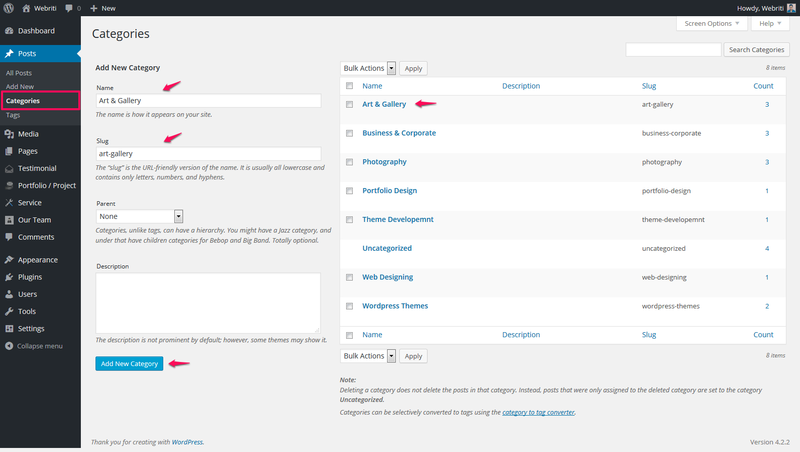 Select Category for Slider – Select Category Slider option. After select this option your all category will display and select category. Select Slider Animation – Select Animation Slide and Fade. Duration – Enter slide duration between 2 slides. Input Number of Slides – Enter number of slides according to you. 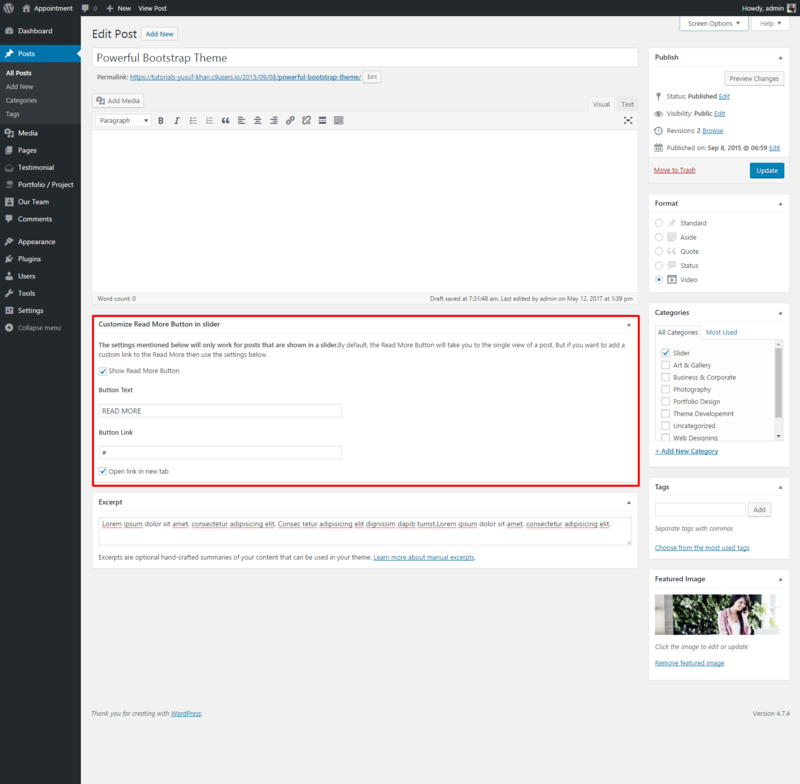 Here you can enable / disable slider post on blog pages (Archive, Category Pages etc). Refer attach screen shot. Here you can enable / disable slider from Home Page. Refer attach screen shot. 6. Can I Display Custom Button on Slides? Yes of course, You can do it. This features allows you to create a custom button on the slide. When you will create a slide you can find easily this setting by the name Customize Read More Button in Slider below page editor. Enable this setting then enter button text and button link. Refer attach screen shot. 7. Can I Use Html Markup for Slider Description? Yes of course, You can do it. You can display Html markup description only for Standard and Video format Slide. 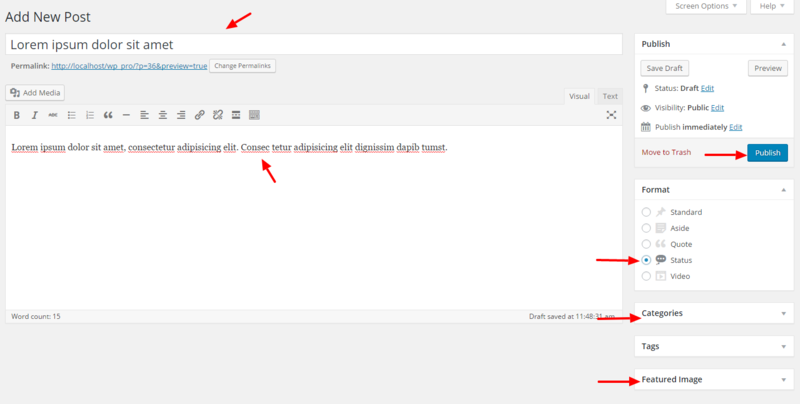 You need to do install Rich Text Excerpts plugin. 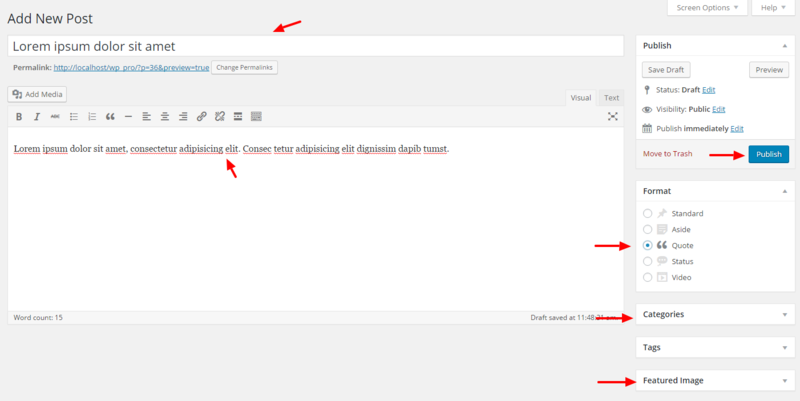 This plugin allow html markup for Excerpt box.